This Etihad A380 seating plan is for the Airbus A380-800, the flagship of Etihad Airlines. Called the Superjumbo, it features four classes, with 'The Residence' cabin before First, Business, and Economy. Business Class has a lounge and winebar. The Etihad A380 seating plan has a cabin layout with economy class throughout the lower deck, in four cabins. Economy seat pitch is 31" in a 3-4-3 layout. Due to hull curve, window seats have restricted legroom. ►Hover mouse pointer over a seat for Etihad Airlines A380 seat pictures, and a description of that seat. Seatback TVs in all classes on Etihad A380, with AVOD (on demand) showing 100 films, and 500 TV programmes. Etihad Airlines have Online Checkin from 24 hours before the flight. 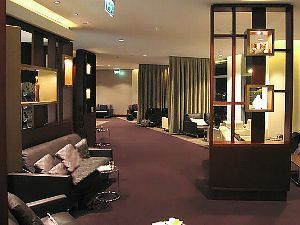 Lounges have a complimentary bar and dining. 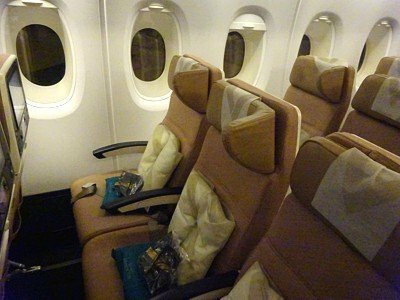 Best economy seats on Etihad Airbus A380-800: In economy the Etihad A380 seating plan has good seats at 49A & K, and 64A & K, however these Etihad A380 best seats are normally reserved for Etihad's most frequent flyers. Etihad A380 Routes: Abu Dhabi to London, Manchester, Paris, New York, Sydney, Auckland, Bangkok, Hong Kong, Toronto, Tokyo, Jeddah, Beijing. Total in fleet: 10. with 429 economy seats in a F11/C70/Y498 config. Etihad Airines A380 First Class is in the nose with individual cabins. These have all the bling of Abu Dhabi, and the substance is just as lacking - they are curiously narrow. Other airlines A380 cabins tend to have 3 or 4 seats across on the wide lower deck. Etihad have 4 on the more cramp A380 top deck. However you get plenty of toys: the cabin has doors, there is access to the walk-up winebar in Business, and two vast lavatories with inflight showers. Etihad A380 Business Class is in a layout with half the seats facing backwards. There is a large walk up bar with sofas at the front of the cabin. If you look at the Etihad A380 seating plan you'll see why many passengers much prefer the front cabin economy seats. With most airlines this cabin is reserved for first class, because it is far away from engine noise and is very quiet, however Etihad has put economy in this cabin. However, all of the seats in this cabin are 'Preferred Seats' with hefty booking fee, unless you are Gold Frequent Flyer or above.